Kate in Mojo Magazine cover feature! THERE’S NOT MUCH YOU can get Prince, Tricky, David Gilmour and Stephen Fry to agree on – imagine that dinner party – but they’re alike in their admiration for Kate Bush. Over a 36-year recording career she has never failed to startle, debuting in spellbinding style with Wuthering Heights – a song that brought Britain to a standstill in January 1978 as jaws dropped in front of Top Of The Pops. Not just an incredible voice – although she had that, has that, in spades – and an immediately iconic presence, but a brave, experimental songwriter gifted with a knack for other-worldly melodies. Love and loss, murder and mayhem, Australian politics, maths and ornithology – she’s made it all sound equally magical. 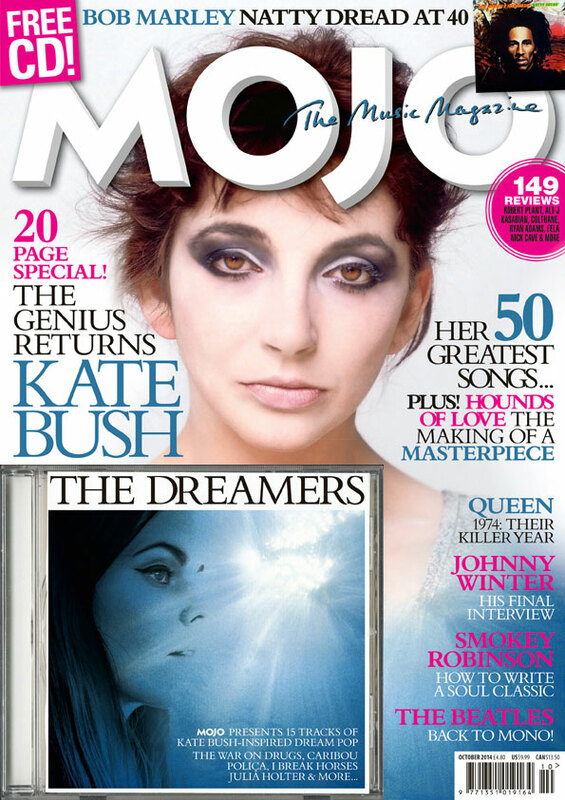 The latest MOJO is a Kate-lovers’ dream as we ponder her 50 Greatest Songs – from the obvious to the obscure, Cloudbusting to The Empty Bullring. There’s also an in-depth look at the creation of her masterpiece, 1985′s epic Hounds Of Love album, relived by some of those who helped make it. Our covermount CD, The Dreamers, is also Kate Bush-themed, with 15 tracks of contemporary dream pop and original female voices to whisk you away from the quotidian grind. The new MOJO is on sale in the UK from Tuesday, August 26. As fate would have it, the same day Bush opens her run of feverishly anticipated comeback shows at the Eventim Hammersmith Apollo. Order the magazine at the Mojo website here.